As Restany would have it, nouveau réalisme was “forty degrees above” Dada in that it took the readymade beyond “negativity or polemics” to become a positive term within a new “republic” of commerce.2 Though the Nouveaux Réalistes were certainly not alone in using the readymade to respond to the effects of postwar consumer culture, Restany was adamant in demonstrating that his artists did it best. 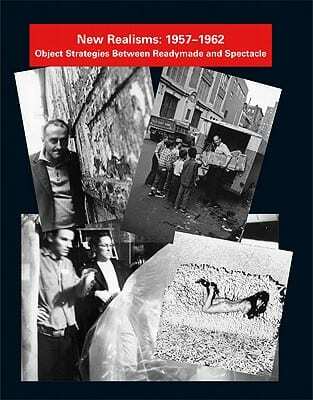 He organized shows in Paris, Italy, and New York to prove it, parrying attacks from the likes of Guy Debord, and competing with exhibitions such as Martha Jackson’s New Forms–New Media (New York, 1960) and William Seitz’s Art of Assemblage (New York, 1961), and with Sidney Janis’s growing stable of young American artists. This competition culminated in a strained collaboration between Restany and Janis for the New Realists show in 1962, when Pop all but trumped the Nouveaux Réalistes in the eyes of the critics, to the disappointment of Restany. Two recently published books—the exhibition catalogue New Realisms: 1957–1962, Object Strategies between Readymade and Spectacle, edited by Julia Robinson, and Nouveau Réalisme, 1960s France, and the Neo-avant-garde by Jill Carrick—put Restany’s formulations in political and historical perspective and usefully identify his advocacy of new realism as just one statement in a larger emerging discourse of new realisms. To counter the dominance of Restany’s voice, both Carrick and Robinson offer new, in-depth readings of specific artists on both sides of the Atlantic and examples of other important occasions when “the real” was beckoned. They point to the coemergence of Nouveau Réalisme with Neo-Dada, the Situationist International, Fluxus, Happenings, and Pop, and lend a complexity to our critical understanding of postwar artists beyond prescribed groups or manifestos. In doing so, they underscore a consistent international interest in postwar consumer and spectacle culture. In New Realisms, which accompanied Robinson’s 2010 exhibition of the same name at Madrid’s Museo Nacional Centro de Arte Reina Sofia, Robinson coins the term “object strategies” to characterize the aesthetics of the period. Her thesis, that between 1957 and 1962 there was a shift in emphasis from the object-fetish toward the spectacle, frames the catalogue’s concern with the theater of display and reception in art of the period (24). In her introduction, she locates one founding moment for this development in Marcel Duchamp’s famous account of the art coefficient at a symposium in Houston in 1957, and one closing moment in the installation of Claes Oldenburg’s performative installation, The Store, in Janis’s New Realisms show. With Duchamp’s identification of the gap between intention and reception, Robinson argues, the work of art in this period transcends mere object status and ushers in ever-broader definitions of “the creative act” directed at an emerging spectacle culture (26). She discusses Klein’s Le Vide, Robert Whitman’s experimental theater, Tinguely’s staged Manifesto Drop, and other art world promotional spectacles in these terms. Robinson’s description of the self-conscious attention that artists now gave to disrupting the art gallery as an expectant site of the luxury fetish is a brilliant way to capture the new dynamics of the period. But the reader is also left wondering if this specific explanation of “proto” institutional critique really demonstrates that spectacle trumps fetish in this period. Doesn’t Oldenburg, beyond the performance of The Store, also specially rally the fetish qualities of his often repugnant and sloppy material to disrupt the theater of consumerism? In fact, many of the objects included in the exhibition and pictured in the catalogue, but not directly addressed in any of the essays, indicate that the tension between fetish and spectacle, between materiality and immateriality, and ultimately, between the real and fantasy production is much more complicated and pervasive than it at first appears. Yayoi Kusama, Öyvind Fahlström, Piero Manzoni, Wolf Vostell, Robert Watts, and even Allan Kaprow (despite his efforts to deny documentation) have left a surplus of material that remains haunting long after the ephemeral spectacle tactics described by Robinson. For the core of the catalogue, Robinson invited new essays by Hannah Feldman on Hains, Agnés Berecz on Restany, and Emmelyn Butterfield-Rosen on Raysse. Each is rich on historical detail of particular players within the scene. Feldman nicely addresses the political implications in the linguistic décollagiste appropriation of Hains’s palissade series. She argues that Hains situated his appropriated planks within the gallery so that they variably indicated their obstruction of the real (in their original function of literally shielding passersby from construction sites and in acting as a substrate for spectacle-oriented movie posters), even as they were themselves real pieces of the street. She describes his appropriation as neither explicitly engagé nor complicit, but responding instead to the multilayered language of resistance found in political graffiti and posters on the streets of France at the time (48–49). Berecz’s essay recounts Restany’s failed effort at a “conquest of America” in the 1962 show at Janis Gallery (59). At the time of its conception, Restany assumed that the Paris-based artists had an advantage over the junk aesthetics of the Americans that Janis initially proposed. By the time of the exhibition, Janis had discovered the Pop artists, and in the catalogue, he asserted their cool new style as eclipsing the Europeans. (This amazing document of postwar nationalism is transcribed in the back of New Realisms.) Berecz discusses Restany’s failure partly as a result of the conflicting ideological investments in his position—both as an advocate for the continued priority of French over American culture and as a Gaullist who was sympathetic and even enthusiastic about what others cynically called the Coca-colonization of France (60). Butterfield-Rosen’s essay describes the new presentational paradigm of the vitrine and commodity fetish in Raysse’s work. In reading Raysse’s own explanations of his pieces, one gets the sense that his art was probably the closest and most literal materialization of Restany’s Gaullist politics. The essays in New Realisms enrich Benjamin Buchloh’s long-held claims that postwar European and American artists were caught between new relations of spectacle culture, emerging Cold War political regimes, and their repressive effects on historical memory. Robinson actually includes one of Buchloh’s first essays, “Formalism and Historicity: Changing Concepts in American and European Art since 1945,” originally written in 1976, as the closing argument for her catalogue. Written before his better-known articles on the Nouveaux Réalistes, “Plenty or Nothing: From Yves Klein’s Le Vide to Arman’s Le Plein” (1986), and “Villeglé: From Detail to Fragment” (1991), “Formalism and Historicity” is itself a historical document (and opens to a nice selection of primary documents, images, and timelines). In this classic essay, Buchloh comes to the conclusion that American postwar art was symptomatic of the country’s political and consumer atmosphere caught up in the “abstract ideal of cultural production,” whereas the postwar European artists were more concerned with the “actual governing conditions of social reality” (95). But his examples (for instance, that Kaprow quite consciously built an artistic and social historical lineage for his work, while Klein fell into the trap of artistic narcissism, to say nothing of Restany’s own presentist claims) tell a more complicated tale. Buchloh acknowledges this in a preface written for the republication. While the general social and ideological formations of his original essay still stand, he argues, nuances among “conflicting artistic, historical, and political impulses” had not quite been worked out when he wrote the essay in 1976 (77). These complexities, with a few more decades of reflection and new research, are exactly what the other essays in the volume address. Jill Carrick’s Nouveau Réalisme also takes up the task of extending many of Buchloh’s initial assessments of the Nouveaux Réalistes as positioned in a precarious place of traumatic history and amnesiac spectacle culture. Carrick’s is the first book-length critical volume in English on the group. As the author claims, it does not pretend to be an overview (and lacks a true introductory summary of the movement). It is also not as broad in articulating the connections of the group across the Atlantic as New Realisms. Instead Carrick is driven to offer key case studies of a few artists from the “inner circle” whose work most directly challenged Restany’s understanding of New Realism as a surface-orientated “transparent celebratory visuality” (5). In the charged, outmoded objects Spoerri, Saint-Phalle, Tinguely, and Arman used to make their works, Carrick finds a consistent “traumatic realism,” in which a consumer-obsessed France is haunted by the uncanny return of the war and prewar eras (92). In the first two chapters Carrick argues that many of the criticisms levied against the artists—that they simply perpetuated the operations of fetishistic, accumulative, and destructive behaviors in their uncritical appropriation of consumer culture—were actually a result of the way Restany and other critics were debating who was truly avant-garde and what that meant in the postwar atmosphere. Though she doesn’t go into detail about how the artists felt about their critical reception, she does successfully separate Restany’s agenda from the more multivalent impulses manifest in the works themselves. First she brings Restany directly into dialogue with Debord, one of the group’s most vocal critics; the Belgian artist Pol Bury; and the curator of Mythologies Quotidiennes, Gerald Gassiot-Talabor. For greater perspective, she also brings in a 1962 tract by the French critic Robert Estivals, who uses the term “neo-avant-garde,” to dismiss both Restany (as a neo-conformist) and Debord (as a neo-anticonformist) alike. In this context, the position of the Situationists (and Debord in particular) as self-described radicals in opposition to the reactionary complicity of Nouveau Réalisme is usefully problematized. But Estivals’s own accusations against both critics as being locked in uncreative, illusory, spectacular repetitions of the past are also seen in light of his own agenda to parade the Lettrists (with whom he was associated) as more authentically avant-garde (54). As Carrick unpacks this discussion, she lends a historical specificity to the development of neo-avant-gardism. Beyond the obvious demonstration of how cultural partisanship affected the historical reception of Nouveau Réalisme, what is ultimately useful about this debate is the way each critic addressed the strategic (re)use of the readymade in relation to the real. The overarching question was this: in appropriating some fragment of French consumer culture, was an artist simply and tautologically redisplaying it, or creating an uncanny and dramatic disturbance of its fetishistic condition? 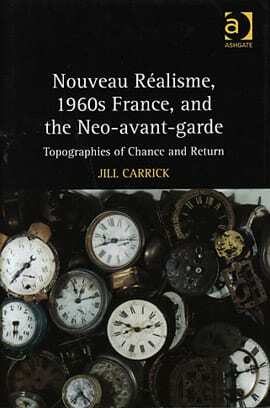 If Carrick describes the historical reception of Nouveau Réalisme as unresolved in this regard, her analyses of Tinguely, Arman, and Spoerri clearly pinpoint the false polemic of the debate. She sees that these positions comingle meaningfully as a recursive topography of past and present material structures. Her most sustained argument is made in discussing Arman’s strategies for disrupting contemporary display mechanisms in his choice of objects and titles—especially in pieces such as Home Sweet Home (1960), an accumulation of gas masks, or in the accumulations of watches, glasses, and teeth from the recent past. She reads these pieces through Freudian and Marxist theories of the fetish, describing how Arman’s compulsion to collect the thing (linked to the emergence of the nouveau roman’s compulsion to describe the thing) relates to the historical repression of the Holocaust. She argues that Arman used this repressed material as a topographical interruption of the seamless spectacle of the present. While Carrick’s conclusion is sound, it would be helpful if she explored further how topography is structurally related to the historical and psychological substrata of consumer desire in Arman’s work. Following Carrick’s metaphor of topography, one might expect to see the eruption of cultural geology and memory pushing against, breaking, or reshaping the surface of the glass as spectacle. Arman’s work usually does not offer this kind of disruption. His glass cases quite clearly force the shape of the inside materials. This is all to say that topography and chance, the two “object strategies” (to borrow Robinson’s term) that Carrick features in the subtitle are rather loosely and sparingly applied throughout the book, begging the question of whether these two terms are the most appropriate. One of the most important contributions of the book is Carrick’s argument that the Nouveau Réaliste use of repetition and strategic fetishism is not inherently regressive. She demonstrates that in some cases, they can be explicitly charged to destroy the seduction of consumer attraction. In Chapter 3, for instance, she argues that Tinguely’s outrageous Rotozaza machines, which shattered hundreds of plates in a department store window, are comparable, and not at all contrary in aim, to the Situationist International’s advocacy of détournement and looting practices (which rarely even materialized) (74). Carrick’s fourth chapter, on Saint-Phalle’s Tir (Shooting) paintings, is a welcome addition to the Nouveau Réaliste literature. The artist’s action-spectacles, in which she took a rifle or pistol to her assemblages of kitschy items covered in a heavy layer of white paint, is discussed as a strategic rupture of sexual fetishism. Carrick positions Saint-Phalle as a self-consciously “phallic woman,” or a “fetishized femme fatale sporting phallic props” (112). While Carrick’s use of psychoanalytic feminist theory, building on her earlier discussion of the Freudian fetish, feels a bit dated (especially the discussion of Saint-Phalle’s Medusa complex), her comparison between Saint-Phalle’s ownership of her symbolic aggression and Klein’s orchestration of his female living brushes in the Anthropométries is essential to understanding the gender dynamics of the group and the female artist’s position within it (117). As Saint- Phalle herself noted, “I wanted the world and the world then belonged to MEN. . . . I felt jealous and resentful that the only power allotted to me was the power of attracting men” (116).3 To demonstrate Saint-Phalle’s early challenge to the gendered nature of the spectacle, before she even begins the Nanas series in the 1960s, is a great contribution. Likewise, Carrick’s interest in Spoerri’s work, which has not easily fit into the dominant paradigm of Restany’s formulations, helps flesh out how the Nouveau Réalistes were operating in the larger sociological recovery in postwar France. Carrick frames her introduction and conclusion with a discussion of Spoerri’s Anecdoted Topography of Chance as the quintessential Nouveau Réaliste object concerned with “memory, blindness and opacity” (5). Spoerri’s fifty-three-page booklet is essentially a map composed of outlines of missing objects along with an annotation that lays out the personal and incidental everyday significance of the occluded items. The lost narratives, anecdotes, and citations attempt to recover the French everyday in relation to material objects. In sum, Carrick argues that Spoerri’s book is a map engaged with the disappearing patterns of daily French life—a revision of Buchloh’s earlier claims about other Nouveau Réaliste works (144). The consistent references to Buchloh in both New Realisms and Nouveau Réalisme inspire a curious observation. While all the authors consciously wrest New Realism from Restany’s narrative, they tend to reinforce the (revised) importance of Buchloh’s narrative of postwar art caught in historical ambivalence. Now that these two books offer new resources and stories to complicate our understanding of this history, there is ample opportunity to expand the discourse of New Realism on different terms. Carrick and Robinson’s books will be helpful in continuing to pursue, with historical and comparative rigor, the ways in which different artists addressed the notion of the real in this period in order to bring visibility to a system in which the fetish and spectacle operated in tandem. It is now clearer than ever that the artists of this new multicontinental filiation, even with their differing contentions and political posturing, were all very concerned with discovering how Cold War spectacle culture asserted itself so forcefully, concretely, and pervasively as to become the real. Jaimey Hamilton is an assistant professor of contemporary art and critical theory at the University of Hawai‘i, Mānoa. Her work on 1960s assemblage has been published in Art Journal, October, and the catalogue for the Centre Pompidou’s Arman retrospective. For InVisible Culture and Sphere, she has written on contemporary appropriation and materialist-based art practices. Her new book is called Uncommon Goods: Global Dimensions of the Readymade (Intellect Press, 2012), and she is currently completing SPAM/MAPS: Questions on Asia Pacific Contemporary Art, a book of interviews with contemporary artists from the region.